After getting my prediction for the last quarter's GDP growth wrong I have reviewed my process and have found at least two factors that have contributed to my error. The first of these, as I correctly reflected in my last forecast relates to the seasonal adjustment of the figures. 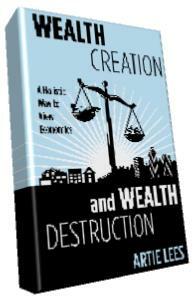 The second relates to the time when many companies pay their corporation tax which impacts on my prediction in two ways. My calculations for the amount of money entering the economy include the difference between government expenditure and revenue and the change in balance of corporate savings accounts. With regards to the government element in the current environment the deficit is generally having a positive effect on the economy however this is reversed when the lump sum taxes are paid, typically January and July. The change in saving can also be considered in a similar fashion. 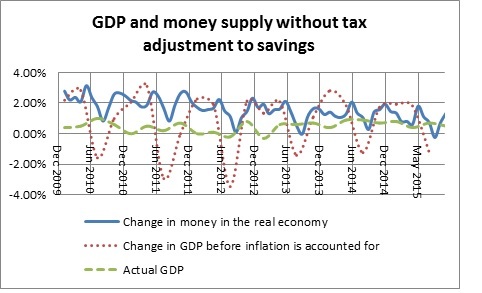 A build-up of corporate and private savings will have a negative effect on money in the real economy and a reduction will result in an increase in economic activity however I have realised that this will not apply to those savings relating to taxes. Like other savings these will reduce the amount of money in the economy but when the taxes are paid the reduction in saving does not directly result in increased spending but will go into government coffers to be spent later. If no adjustment is made this reduction in savings to pay taxes would be double counted. The significance of this change is shown in the two graphs below where the first shows the value of corporation, self assessment and capital gains tax being removed from the sum and second where they are not. The graph where these lump sum taxes are removed more closely resembles economic activity or GDP before inflation is taken into account. 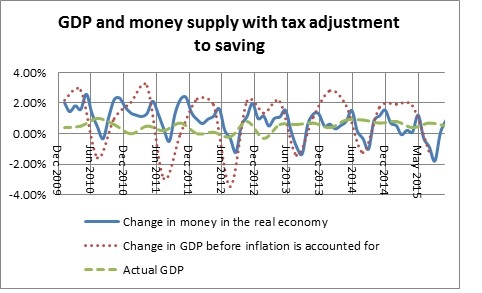 From these graphs we can see that the paying of these lump sum taxes has a clear effect on GDP in the second quarter and to a lesser extent third with a rise and this what caught me out on my prediction for the 2015 Q3 where I mistook this annual rise as a boost to the economy rather than a seasonal feature. Which bring me back to my first error of not allowing for seasonal adjustment. The ONS state that they use the US census software X12ARIMA from the US Bureau of the Census which is free available to download, although in a later version; X13ARIMA. I have installed the software and started to play with it. One of the first tasks was to recreate the GDP figures the ONS issue based on their raw data but my initial attempts bear no resemble to these official figures. In one way this is not surprising as there are many variable inputs that I am yet to grasp however the official figures show no periodic decline in the second quarter whereas they do appear on the seasonal adjustment projection. Whilst I cannot get my model to match the official seasonally adjusted figures there is some correlation with the trend line produced by the software and if this is correct then the money that has entered the economy would suggest 2015 Q4 growth will reducing to 0.25%. For the moment I will run with this interpretation. This revision of process has also thrown up some more points of difference one of which is whether to include the monetary effect of the change of loans. The original model excluded these but as the two graph show there are slight but interesting differences. The two sets seem to better reflect the actual GDP at different times. I think that this may be due to expanding lending have a greater impact than when it is contracting but this will need more investigation. Further investigation is still required to account for the differences and this will include the impact of inflation on the official figures. As noted in the last forecast the Bank of England and ONS data that I have been using are subject to monthly revision meaning that the precise figures I have been generating for past months do not resemble those using the revised data published later. 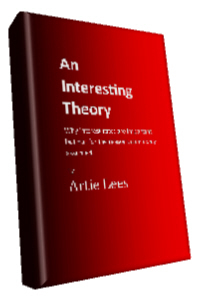 To this effect I will have to revise the format but that is for later. On the basis of the changes described above growth in the fourth quarter of 2015 may have fallen to 0.25%. 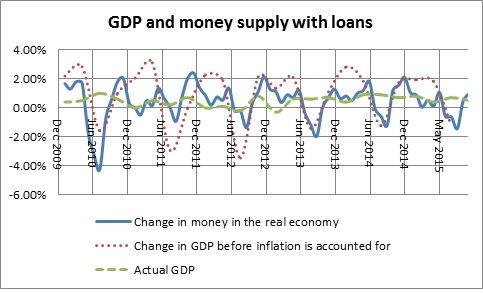 •	Interest created money increased by £6,393m in September an increase of 0.30% to the money supply and in line with previous monthly increases. •	Saving increased by £14,815 in October compared to the £12,313 in September and this contributes to an increase of the money in the real economy of 0.12%. •	And the net increase in government spending over revenue was £10,967m compared to £9,549m (£9,549m) for the previous month. This represents a net drop of 0.07% to the real economy although when the changes are averaged out over the last 12 months the level of government spending over revenue increases by 0.29%. Lending that on mortgages represented 68.11% and a drop of 5 points on the previous month. This is up from 68.16% on the September and is a reversal of the long term trend. The importance of this figure is explained here. 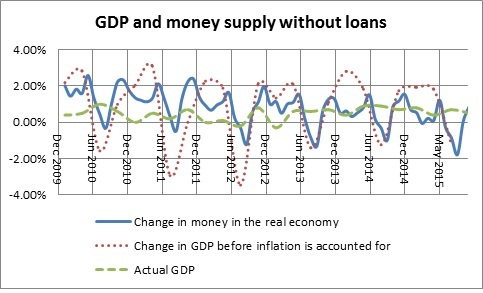 Based on the proportion of interest created money from mortgage lending underlying inflation lies at 0.10% a year, a slight continuing the steady decline fall, but is not manifesting itself due to deflationary forces elsewhere in the economy, principally the fall in commodity prices and general constrictions on the money supply due to low interest rates.